So many different ways to go this morning and genuinely had a ton of fun with the research on a truly great list of Cardinals. Berkman etched his place in St. Louis history as the wild card signing, something I hope Mark Reynolds does and sticks around for multiple seasons. I had to go with the local boy after coming across a picture of Freese donning #12 and crazy to think he will be a free agent after this campaign. Would a reunion under the Arch make sense for both sides? 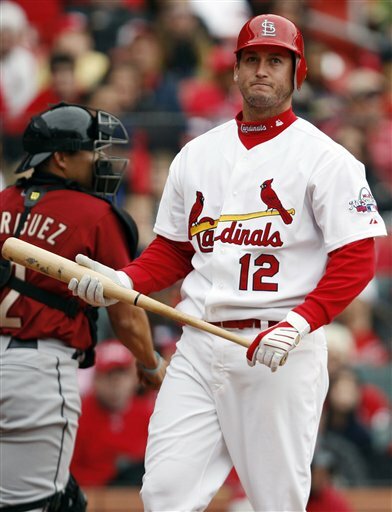 I’m in favor of bringing back just about any former Cardinal and had high hopes for the guy who was shipped out West for Freese to do just that. Reynolds will get every opportunity to stick one way or another, as it appears Matheny and Mo are trying to get creative in roster management. That was exactly the recipe for success that Miles found and has spawned everything from websites to the occasional relief appearance. Does that mean the new slugging bench bat is the second coming of the Secret Weapon (spoiler alert!) 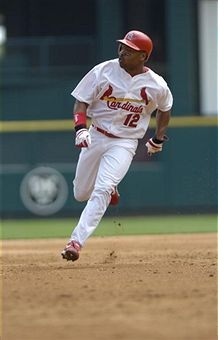 or simply another way to keep an extra infielder on the roster? I’m going with the second option especially as the early roster may feature an extra bat from the sound of this. I was also shocked to see Reynolds is quite a bit younger (31) than I previously thought so here’s to wishing a long tenure for the new St. Louis #12! It seems the other purpose of the jersey was for returning former stars who want to wear the Birds on the Bat one more time. Medwick ended his Hall of Fame career this way, but it was another outfielder that caught my attention wearing something that just seemed out of place. Lankford carried the Cardinals many times during his tenure and sat out a year before making one more run at a title in 2004. He played regularly the first half and until this guy showed up I thought a postseason run may have been possible. I can still fondly remember being woke up in Iraq at 1 am to tune in on the computer for the final stretch of Lankford’s career that September. And in an October contest that brought tears to my Marine eyes, Ray pinch-hit during the sixth inning and gave the home crowd one more glimpse of the past. Lankford put St. Louis ahead for good with that final hit, and it is only a matter of time before he joins the other great centerfielders in the Cards HOF.